The Consumer Electronics Show was in full swing last week, showcasing the latest and greatest inventions that we can expect to arrive on the market in the coming year. Far from the dazzling lights of Vegas, here in the Labs, we have been expectantly watching each new product rolling out and we are starting to notice a trend. A lot of these new products are BIG. This reminded us of early Kinect experiences, which were tested and found to function perfectly in American homes. However, when used in apartments in the UK and Japan, users immediately ran into problems. There just wasn’t enough empty space for the technology to function. The trend towards the urbanization of populations has been marching on for centuries at this point. Space within sometimes-arbitrary city limits comes at a premium, as anyone who has been apartment hunting in San Francisco can tell you. Property is getting more expensive, but people at all economic levels still need to live in cities, so we start to see the subdivision of property. Not only multi-roommate arrangements but also the construction of smaller apartments being built in less space, and the Tiny Homes trend. None of this is necessarily a bad thing; in the companies that have done their research we are seeing amazing developments in technology and ergonomics. You could argue that things like Alexa and similar digital assistants are a part of this. Instead of needing a bulky desktop computer to organize your life and interface with the internet, you now have a device that can fit unobtrusively onto a shelf. Instead of needing a smart-fridge to keep track of your food or a smart shower to keep track of your preferred settings, you can now have connected devices running through a single centralized computer. Managing a limited living space is causing some amazing innovation in what are sometimes quite conservative tech industries. Television size is starting to become an issue for users with limited living space because of the trend towards larger and larger screens. There were two TVs at CES that dealt with limited space in completely different ways: One was the LG Rollable OLED, which can slide down into a compact base when it isn’t being used in a manner reminiscent of futons in Japanese apartment life. The other was one of the biggest televisions at the show; Samsung’s “The Wall” is a modular MicroLED TV meant to provide a cinema experience by occupying whatever space is available. 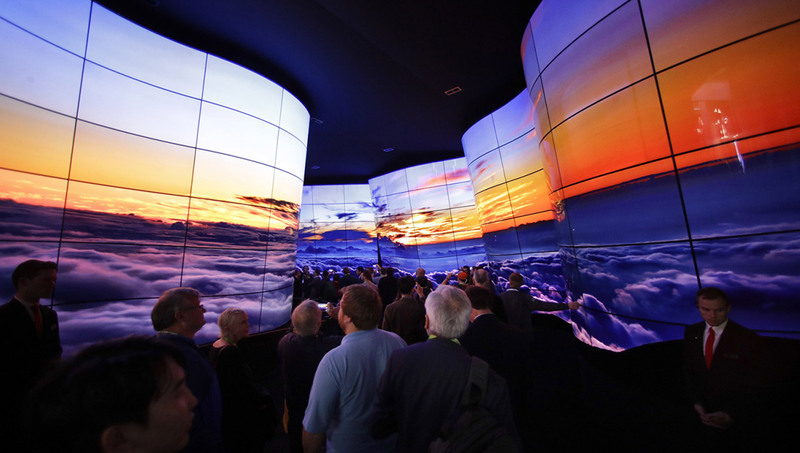 But despite the massive display at CES, this technology is customizable to suit a user’s living arrangements. In some cases, we needed to go and do some research ourselves before a new product made sense to us in the context of urban living. The FoldiMate is an automated laundry folder that is about the same size as a washing machine, albeit taller. Our initial reaction was that nobody would have the space in an apartment kitchen for another appliance of that size. But it started to make sense when we looked at global trends and realized that centralized washing and drying facilities are becoming common. Whether it is a communal laundry room for an apartment building or a local laundromat, reduced apartment size is going to drive users to those communal spaces. Spaces where there is a great market for automated laundry folders. Placing an appliance in that context also alleviates any worries about the price-point as the laundromat industry is currently undergoing a digital revolution with a focus on customer experience. Limited living spaces drive innovation, but that innovation needs the backing of solid user research to function in the real world. Otherwise we end up with Roombas that can’t navigate, digital assistants that get distracted by your neighbours’ conversations and confused Kinects.